Is it Time to Switch from IE to Chrome? According to this chart of browser market share, Google’s Chrome browser is the most popular in the world, in use by 34% of all users. In the USA, though, Chrome takes second place with just 23% to IE’s 42%. So which browser really is best, and should you switch? I don’t think the choice matters to the vast majority of Web surfers, except from an ideological standpoint. The latest versions of IE and Chrome are neck-and-neck in performance, ease of use, security and privacy options. If you hate Microsoft, you may choose Chrome. If you’re afraid that Google is taking over the world, Internet Explorer is one way to resist assimilation by the Borg. That said, let’s look at some of the differences between the two browsers, where differences exist. 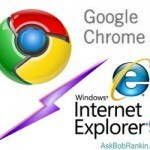 Bob Rankin browsers, Chrome, IE. permalink.